Biscuits and gravy is a simple, hearty dish that is easy to love and difficult to perfect. It requires delicious, stand-alone biscuits and a gravy that’s neither too runny nor too thick. And, surprisingly, it’s hard to track down in San Francisco! However, we’re here to tell you it’s not a lost cause. 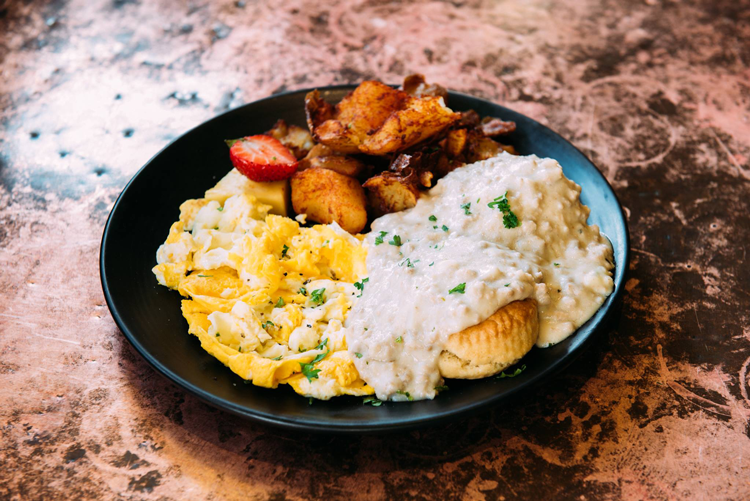 We rounded up the top biscuits and gravy dishes from Silicon Valley, through the East Bay, and into the city — with plenty of stops in between. Try a few (or all!) of our favorites and let us know which dish is at the top of your list. Then, if you need more Bay Area brunch suggestions, check out The 15 Best Brunch Spots in Oakland and The 17 Best Brunch Spots in the Bay Area. Locally sourced, seasonal ingredients, west coast freshness and time-honored southern recipes combine to make farmerbrown a stand-out for breakfast, lunch and dinner. 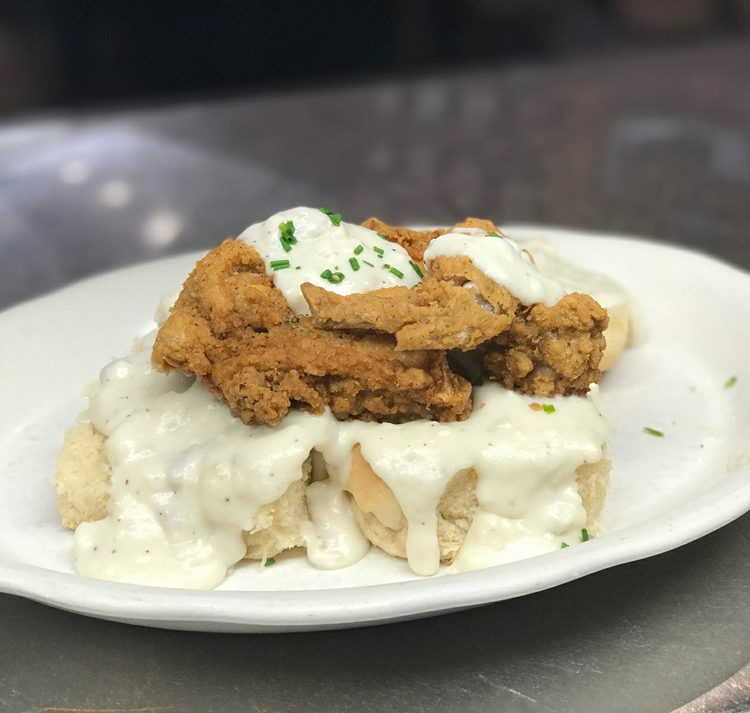 Stop by during the week for a classic breakfast and stop by during the weekend for Come and Get It Brunch — a buffet including their famous fried chicken, cornmeal catfish, waffles, cheesy grits, cajun potatoes and, of course, Angel Biscuits and Gravy! With your choice of sausage or mushroom gravy, you get two eggs any style, cajun potatoes and local, seasonal fruit. You can also order Angel Biscuits and Gravy at Little Skillet, their sister restaurant in SoMa. This Bernal Heights eatery serves brunch every Saturday and Sunday between 10 a.m. and 2:30 p.m. There will be a line but, trust us, it’s for good reason. Their authentic, Southern-inspired menu features items like Beignets, spicy shrimp and grits, fried chicken and some of the best biscuits and gravy in the city. Served with true, country-style gravy plus an artisan Front Porch cocktail makes for a perfect morning. This cozy log cabin has been in Albany since 1930, but it wasn’t always a destination brunch spot. Before becoming an East Bay eatery, this old Sears Roebuck catalog home served as a speakeasy, a roadhouse and an off-track gambling spot. Today, they embrace their history and old-school charm through sustainable practices inspired by old-world kitchens, including whole animal butchery, in-house curing and locally sourced ingredients. Order the biscuits and gravy and you’ll be planning your next trip in before you finish your plate. Ask anyone who has visited this downtown Los Gatos restaurant and they’ll tell you exactly where to find the Bay Area’s best biscuits and gravy. Family owned and operated for over 20 years, the team at Southern Kitchen has taken the time to perfect wholesome quality food with a touch of southern flavor. After you fall in love with the dish too, we recommend a return visit so you can taste the Belgian Churro Waffle and all seven Eggs Benedict plates! As one of the essential farm-to-table restaurants in San Francisco, Plow serves a breakfast menu every day with slightly different options on weekends. Come back for both so you can try the Dungeness Crab Scramble during the week and Max’s Buttermilk Biscuits + Gravy during the weekend! Order this savory dish and you’ll get perfect biscuits covered in homemade pork sausage gravy and two eggs. We already highlighted Hopscotch as one of the 15 best brunch spots in Oakland — and also mentioned their delectable biscuits! We obviously can’t get enough. Chef Kyle Itani’s menu is made up of American regional classics influenced by Japanese flavors and techniques which makes the brunch menu one of the most interesting in the region. Their biscuits and gravy dish is served with sausage gravy and biscuits made from Soba, the Japanese word for buckwheat. Calafia Cafe began in 2009 when Charlie Ayers leased space in the Town & Country Shopping Plaza across from Stanford University and realized his dream of owning a healthy, sustainable neighborhood spot. Their impressive menus of farm-to-table cuisine include breakfast all week and a weekend brunch. But you’ll have to wait for the Saturday and Sunday menus to get a taste of homemade buttermilk biscuits and Southern-style milk gravy! Located along the Embarcadero, EPIC comes to us from the executive chef and team behind Waterbar. During the week, they serve a must-try menu of steakhouse classics prepared with the custom-built wood-burning grill and oven which serves as the focal point of the dining room. And on the rotating weekend brunch menu, you’ll find homemade Biscuits & Gravy served with honey butter and sausage gravy. This Oakland taphouse and brasserie is driven by fresh, California ideals and inspired by traditional French and Belgian cuisine. That means brunch brings plenty of craft cocktails, lots of fried chicken, crispy catfish and mouthwatering, homemade biscuits! It’s all worth a taste, but if you’re here for the biscuits and gravy, you definitely won’t be disappointed. This classic American diner does comfort food right. One of the house favorites is the biscuits and gravy, a dish that includes toasty, buttery biscuits topped with homemade sausage gravy and served with home fries. You don’t want to miss this hidden gem in Nob Hill! Let us know which local biscuits and gravy dish has stolen your heart — even if it’s not on our list!